I'm a girl of colour and I'm not afraid to be a rainbow. But do you, like me, have days when all you want to wear is black everything? Black makes a very powerful statement and I think people never really know what you are thinking or how you are feeling, all they see is a strong individual walking down the street. However, I'm the type of individual who likes to be noticed in a room, so I wore a blonde wig which radiates a beautiful glow in the sunlight. It also keeps the whole outfit looking much less formal. 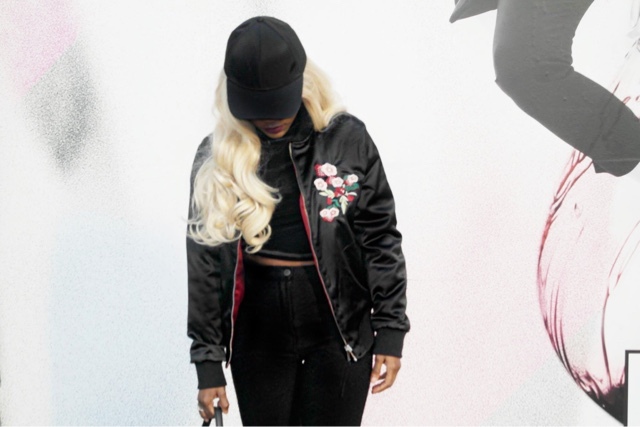 The black Primark bomber jacket has some beautiful floral embroidered details on the front. 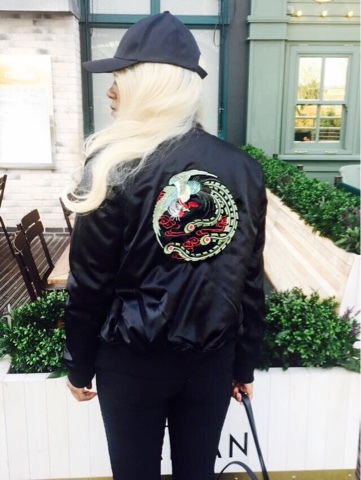 The best thing about this jacket is that you can wear it inside out, the out side has this old school baseball jersey design which is just fab and it's quilted. Perfect for winter. So, what do you guys think about this outfit? Great outfits love the jacket !